Built by Robert Moses, the East River Park has been rethought by our community and is now in a titanic battle on the front lines of climate change. Members of the new East River Alliance invite you to explore the unique history, biodiversity, and contentious plans for East River Park’s future. Long-time community residents Dan Tainow and Wendy Brawer (of Green Map) will highlight social resilience, visionary planning, and access to nature issues that impact all coastal communities. 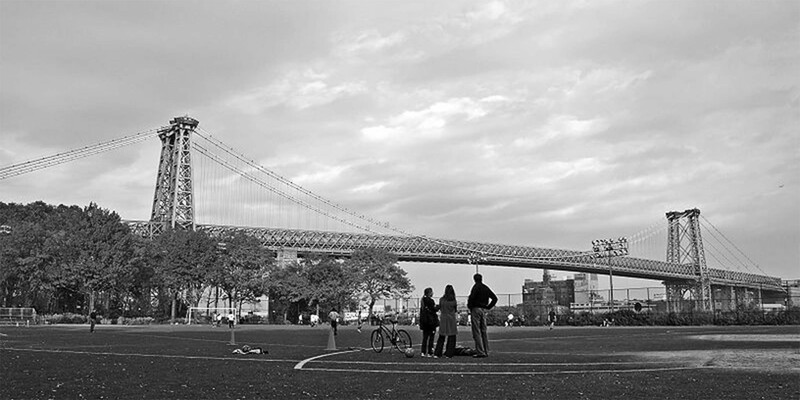 East River Park in Fall. Photo: Wikimedia Commons, David Shankbone. Modifications: photo cropped and transformed to black and white. Ends at the new Eco Park at Pier 35, on the East River at Clinton Street.